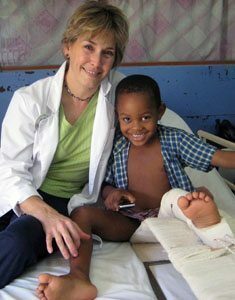 Wesdock shares a smile with a young physical therapy patient in the Caribbean. When Kim Wesdock travels to the Caribbean, she often struggles to keep her luggage under the 50-pound weight limit, but for a different reason than most tourists. 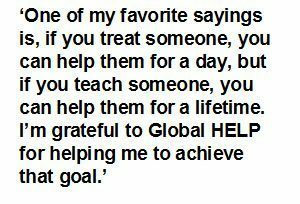 Wesdock believes in Global HELP’s mission to provide free and low-cost medical information to people in developing countries. 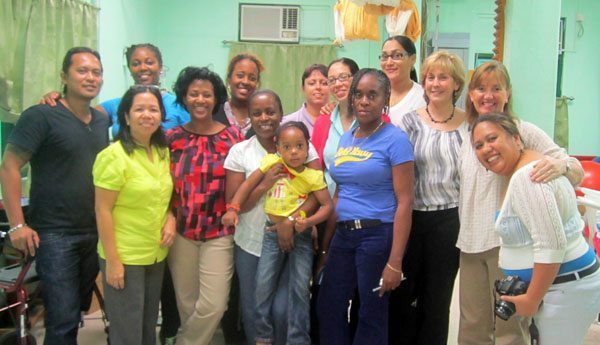 Wesdock (third from right) – posing here with training participants in St. Vincent – has volunteered as an instructor on medical-mission trips to Grenadine, St. Vincent, St. Lucia and Haiti.